On 28th August we got up early to finish our memorandum about the living conditions of refugee women in Germany and our demands addressed to the Interior Minister. We had been trying to finish them for the last three days but didn’t have enough time to do it. Before 9.00am, while we were still in the flat of Mrs Nötz who was accommodating us in Berlin, we called the Ministry to find out if there was anyone who was willing to receive the memorandum. Most of the staff members we wanted to reach were on vacation but finally we were directed to a Dr. Klos (the head of the “foreigners’ law” unit) who advised us to send the memorandum by email or by post, since he could not receive us at such a short notice. We decided to email it but we were determined to hand it over personally, too, even if this meant leaving it at the reception desk. 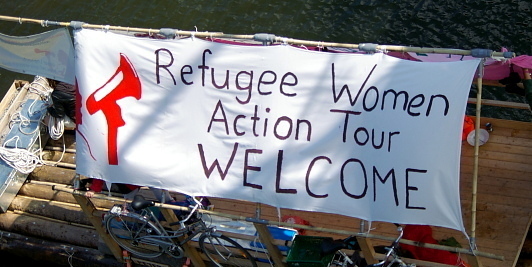 This was a way of letting the authorities know that we had been travelling from Nürnberg to Berlin with rafts for the last seven weeks for good reason, visiting different Lagers, talking to women and documenting pressing issues faced by refugee women. This is how 15 of us found themselves standing in front of the Ministry of the Interior. In front of the building we rolled out our banner reading “Welcome Refugee Women Tour”, but before we could strategize on how or who should go to the reception a very rude private security guard came out of the building and demanded that we leave the compound immediately because it was “private property” or he would call the police. We tried reasoning with him but instead of reasoning with us he kept threatening us with the police, although we told him that our aim was either to give our memorandum to Dr. Klos whom we had talked to earlier or just leave it at the reception so that someone could pass it to him. The security guard told us that he did not care about what we wanted and if we did not stop the demonstration and go he would call the police. We decided to fold our banner but to stay since this was a public office and we felt we had a right to go in and present our memorandum. He went inside and shortly afterwards the police came and asked us what we wanted. First we complained about the way the security guard had treated us and then we repeated the story all over again. The police told us to wait while they contacted Dr. Klos who came out and received our memorandum and promised to pass it to the relevant staff of the Ministry. After we complained to him about the security guard, he told us this was necessary for security reasons and we told him that refugee women in Lagers need security too. Dr. Klos has since replied to our email telling us that he passed the memorandum to the appropriate staff. This we should follow up to find out the outcome.